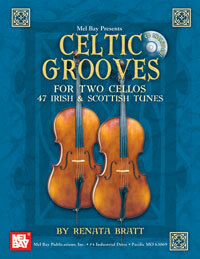 A book of traditional Celtic tunes arranged for cellos with rockin' groove and chop-based accompaniments. Includes forty-seven tunes from Ireland, Scotland, the Shetland Isles, and Canada in duet arrangements, all chosen with cellists in mind and in a variety of styles including jigs, slip jigs, reels, strathspeys, planxtys and airs in traditional keys. Performing in the groove is so important for string players that the American String Teachers Association recognizes this skill as a separate category in their Alternative String Style Awards. Playing these idiomatic and often syncopated accompanimental patterns is a great way to learn these styles. Includes online audio with all arrangements performed by the author.